You and your poop, what’s up? How are you droppin the kids off at the pool? At this point you are either about to click away from this post because you thought I was going to wax poetic prose on all things savory and beautiful, or intrigue has settled in and you’re curious where this pooping post will go. Have you ever done a song and dance because you managed to go #2 more than twice in one day? Gone in and cleaned house to walk out a new person? Or given yourself kudos for eating your greens all the while contributing to a good poop? My friends and I came into our more health-conscious and responsible 30’s with Dr. Oz being our go to TV doctor. And in the midst of our Oz admiration, there was this pivotal moment for us as I’m sure for many of you, where you heard Dr. Oz say something to the effect of, your poop should be a specific color and shape. From that moment on you either a) became obsessed with producing that almighty perfect “S” shaped poop, or b) didn’t even blink and continued inhaling your White Castle LaxiBurgers. My friends and I are members of the former group—the perfect poop over-achievers, so much so that we speak about it on a regular basis—“Mujeres I just took the only crap”, “OMG…I finally went after not going for 3 days”, “High-five manita for finally going after 3 whole days”, “Ahhh I feel 10 pounds lighter”. 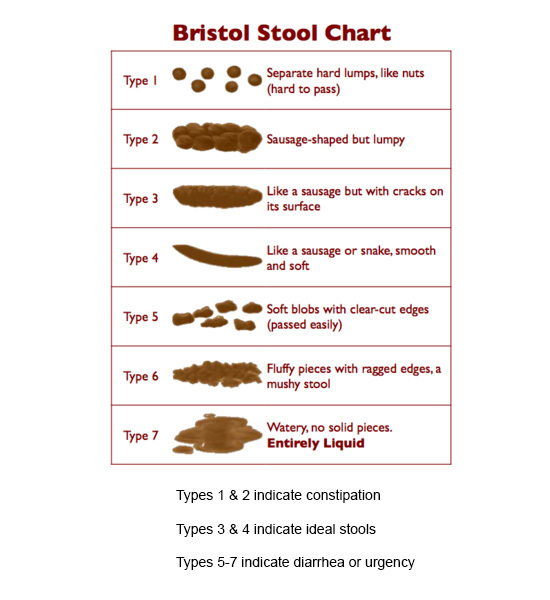 So it was no shocker when recently one of said friends texted us a picture of the Bristol Stool Chart (a.k.a. Meyers Scale in the U.K.). It was absolutely magical—our pooping wonderment satisfied in one simple chart. And naturally I had to pass this along to anyone who is just as obsessed with their poop as we are!